The evolution of ECM from monolithic content management to cloud content services requires rethinking many touch points for both creating and consuming content. It is more important than ever for the architects and IT owners of these user experiences to understand what external and internal integrations could affect the performance, stability and security of the solutions they design. In other words, when the user calls at two in the afternoon complaining they can’t view a document, how do you know what is broken? Worse yet, when that internal report shows up on social media, just who leaked it from where and when. This has never been an easy problem to solve but it at least it was conceptually more simple when the standard was to put (most) everything into a single bucket. Formerly massive ECM’s though are slowly being disassembled into multiple independent services that can run anywhere. Being able to pinpoint where in the integration chain a given problem originated could mean the difference between seconds or hours of downtime. Or millions in fines if the right procedures related to that content are not followed. I had the chance to look at the latest release of Reveille’s product for this space. No doubt many of you are already familiar with them as they have has been a part of the ECM ecosystem for close to twenty years. 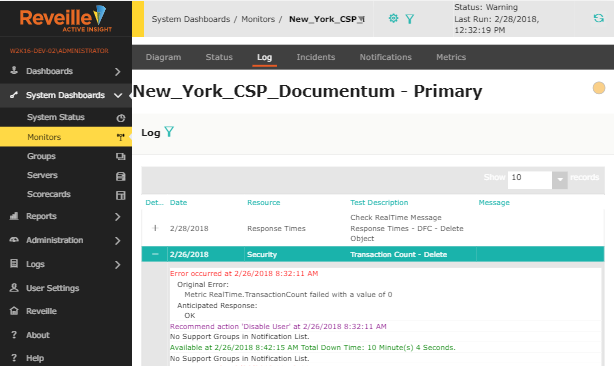 Beginning life as an integrated monitoring console for document imaging platforms, it has evolved to provide a full range of customizable monitoring and analytical tools for content management system operations. Recent redesigns have included a new responsive UI and API’s that enable very flexible mobile or integrated application experiences. This is more than mere power and ping monitoring though. Reveille today provides powerful analytics to help both business and IT users understand the behavior and state of discreet components in complex ECM environments. Reveille breaks down the activity in three pillars. Experience, Behavior and Operations. To me experience and operations pillars are the more mature use cases. Reveille has had a unique proposition for many years in that that they focus on content systems and as such provide a context that other offerings in the space lack without significant customization. The messaging is changing faster with the idea of behavior. More businesses are pressured on a daily basis to respond to security and audit requirements that they have previously had to deal with by assembling data from many different sources to recreate the context of suspicious activity. Having access to and understanding of the metadata related to that content allows is a powerful tool. 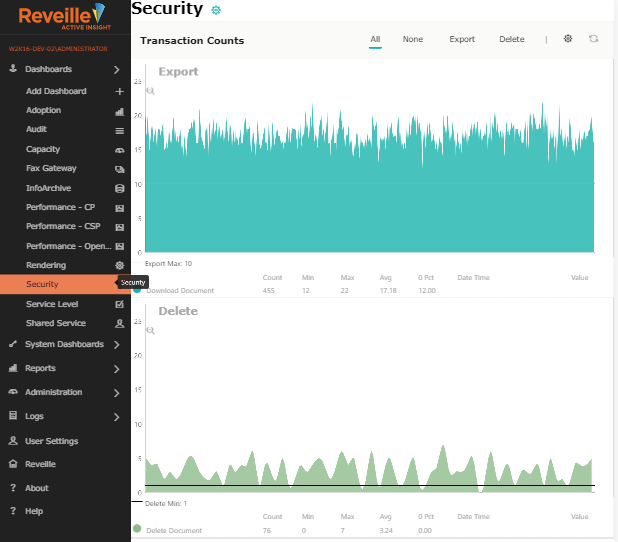 In addition to supporting post event forensics, Reveille will allow you to create monitors that can alert when content is accessed outside of normal hours or in unusual volumes by users that do not have business reasons to access it. The platform can proactively alert and even suspend access. Being able to derive this insight at the content service layer is critical. In ever increasing numbers, systems that aggregate access to multiple stores through such services are the norm. Responding to compliance auditing is exceptionally difficult if you have to correlate access logs from disparate sources. Building this capability into access applications is one approach but it is very inconsistent across all applications that may access the same data. Especially considering the change of requirements over time. Using a tool like Reveille that has native connections back to the source systems allows you to normalize that reporting without depending on the capricious designs of front end applications. Not only are the compliance requirements changing, how the economic value of the solutions is structured is changing too. Vendors struggle to figure out the right way to monetize the content services they provide. The legacy providers cling to perpetual license models, spinning and wrapping them in subscription verbiage making the move to pure consumption models glacially slow. Reveille and other monitoring solutions are similarly challenged. You might assume they should follow whatever model the source systems are based on but when you are creating a common view across a services landscape with different underlying license models it is not so simple. I will not describe their current strategy. I will ask you. How should this kind of solution be sold? What billing metric makes the most sense from the buyer’s perspective? Content services user? Transactions counts? Content under management? Tell me what you think in the comments.